Big Sur is a rugged, mountainous section of the Central Coast of California, where the Santa Lucia Mountains rise abruptly from the Pacific Ocean. Highway 1 winds along the precipitous mountain sides, back into narrow canyons then out to the broad Pacific. Wildflowers of many kinds abound and wind shaped trees line the ridges. I have spent many days exploring the coast and looking into some of the canyons cutting down the mountains where there are redwoods and firs, pines and cedars. 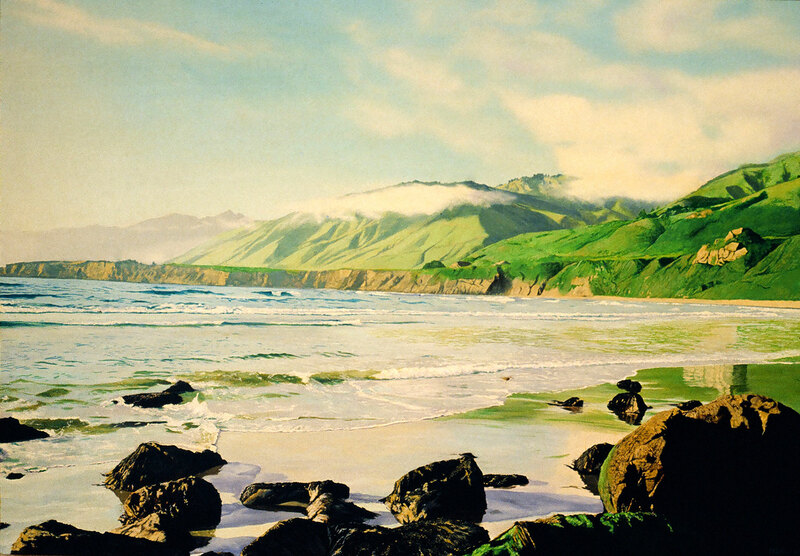 The Big Sur coastline goes from Ragged Point in the south to Carmel river in the north. 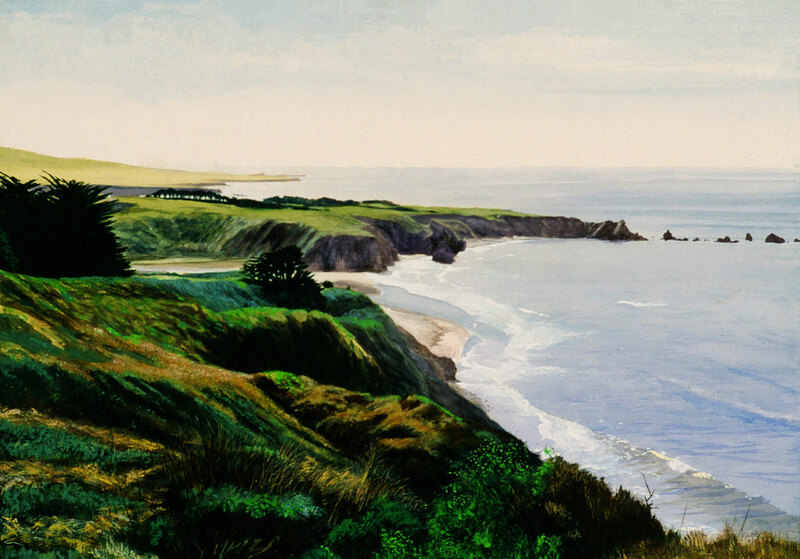 Ragged Point Acrylic on water color paper | 26.5" x 42" Looking south towards Ragged Point. Ragged Point has always seemed to me to be the start of the Big Sur coastline from the first time I drove up Highway 1 in 1965. 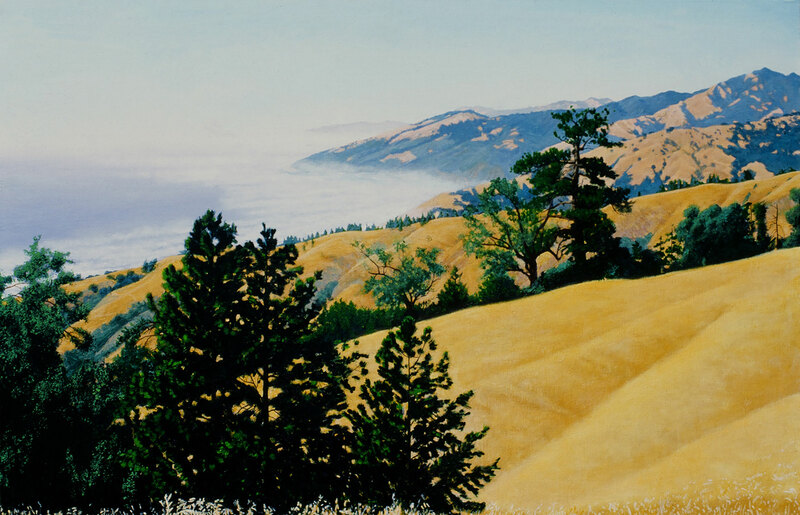 Big Sur from Ridge Road Acrylic on canvas | 36" x 54" Looking north, across the Santa Lucia Mountains , from the South Coast Ridge Road. Sand Dollar Cove is in the fog below. 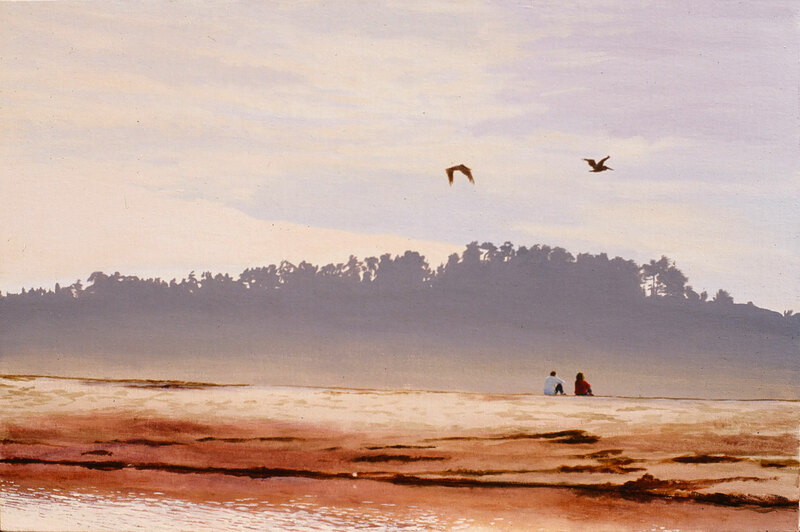 Sand Dollar Beach Acrylic on canvas | 40" x 60" Sand Dollar Beach on a glorious day. Rain at Sand Dollar Beach watercolor and acrylic on watercolor paper | 26.5" x 42" I spent three days at Sand Dollar Beach, with my wife and son, mostly in the rain. A beautiful experience, beautiful but wet. 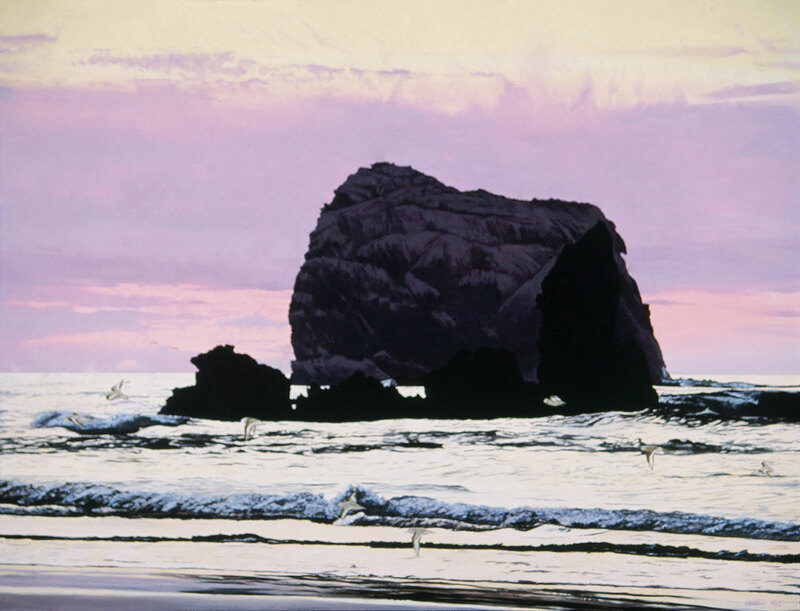 Sand Dollar Cove, Sunset acrylic on masonite panel | 39.75" x 51.75" A mellow evening on Sand Dollar Beach. Birds flying north. 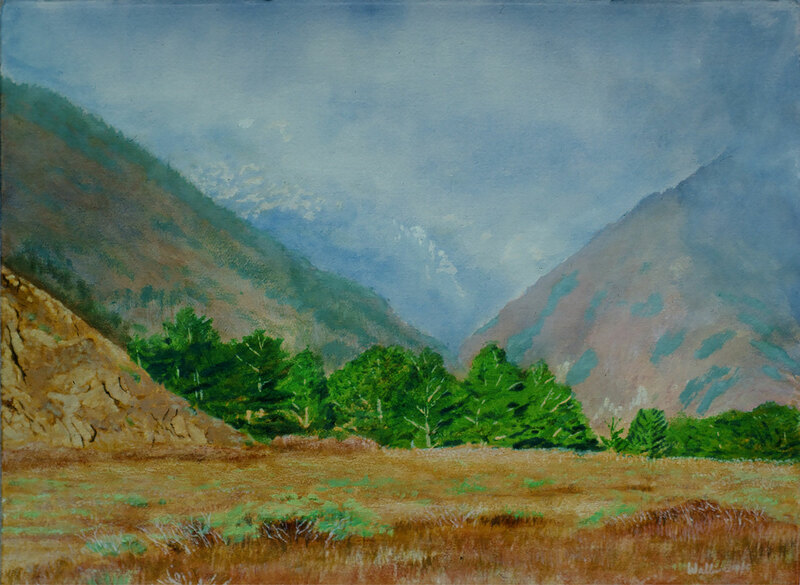 Afternoon Fog in Big Sur acrylic on 300 lb water color paper | 22" x 30" Looking inland. The mountains shrouded in clouds. 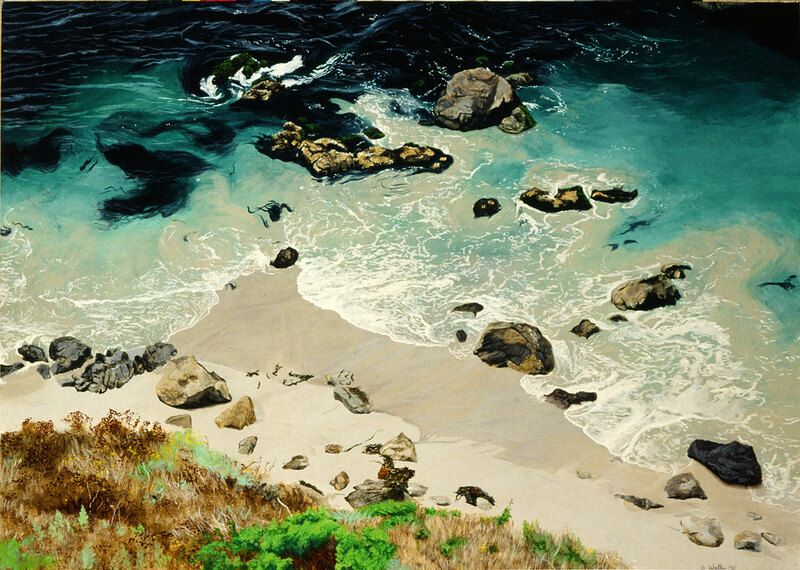 Tidal Swirl acrylic on canvas | 36" x 48" Looking down from a turnout along highway 1. One never knows what will show until you look. 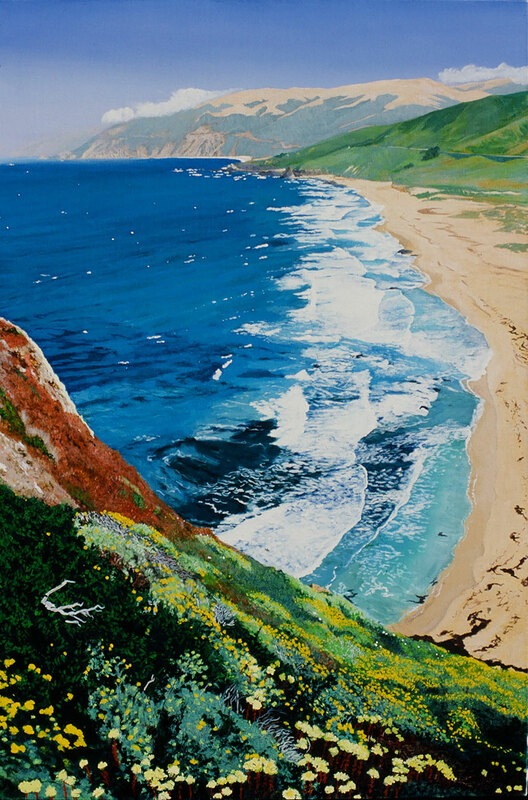 View from Point Sur acrylic on canvas | 54" x 36" Looking north from the top of the morro at Point Sur Historic State Park. There is a lighthouse and other buildings here. 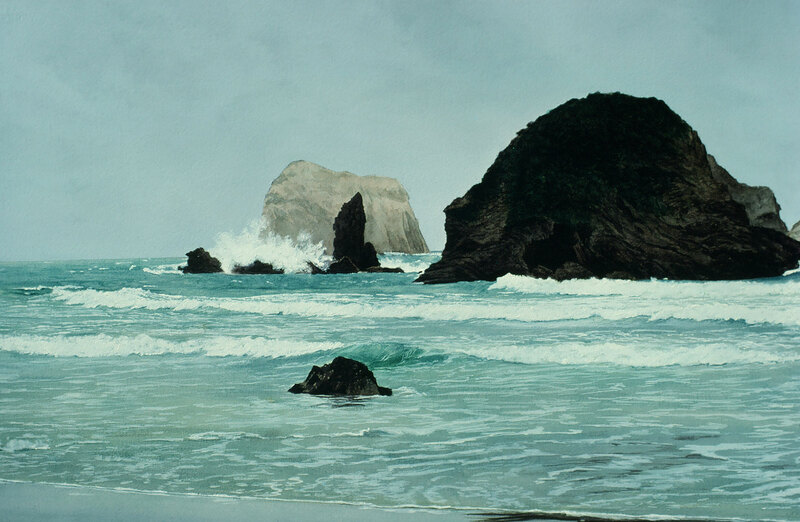 View from Point Sur toward Little Sun acrylic on canvas | 6" x 12" Looking South with Point Sur Historic State Park at the end of the land spit. 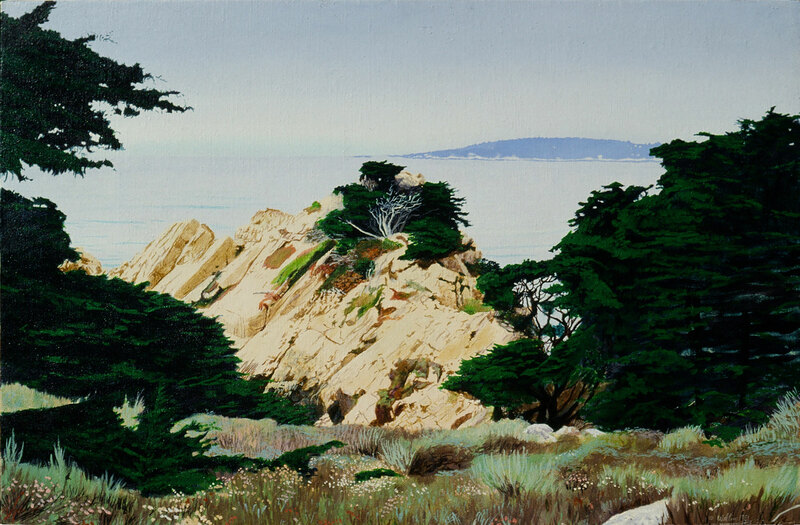 Point Lobos acrylic on canvas | 24" x 36" Cedar Point in Point Lobos State Natural Reserve. One of the most beautiful natural places I have ever visited. 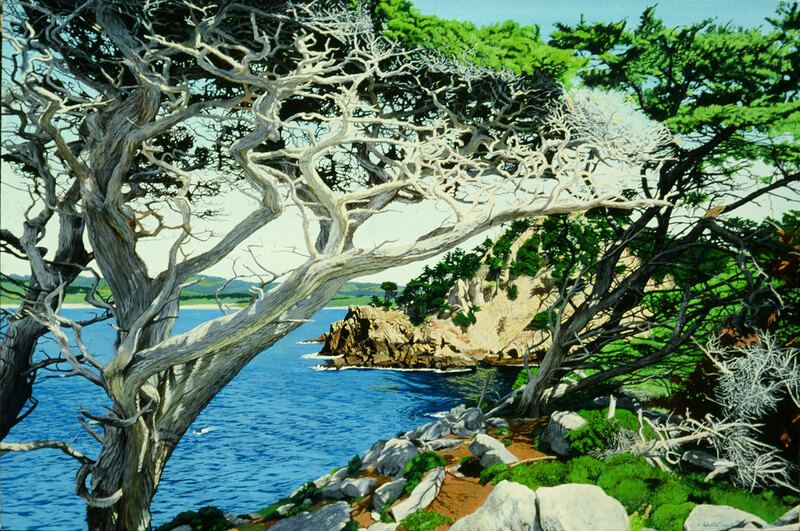 Cypress Point acrylic on canvas | 48" x 72" Cedar Point in Point Lobos State Natural Reserve. This tree was already an old tree when I painted it. The last time I was there it had fallen apart. Evening, Carmel acrylic on canvas | 24" x 36" From Carmel looking back at Point Lobos. 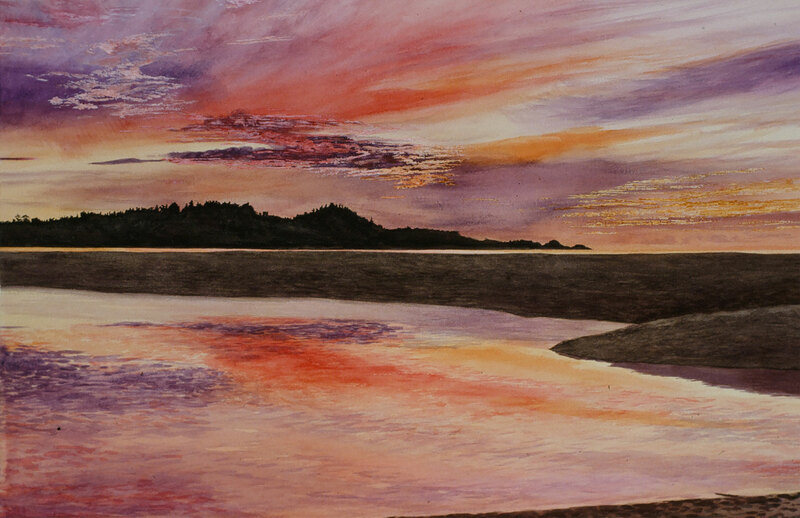 Mouth of Carmel River Sunset acrylic on water color paper | 26.5" x 42" From Carmel looking back at Point Lobos during a spectacular sunset.